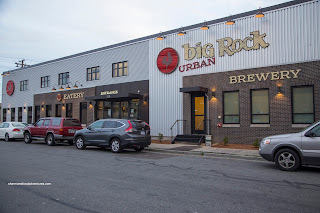 Ever since spotting Big Rock Urban Brewery and Eatery with my peripheral vision while cruising down 4th Ave, it has been one our planned destinations after hockey. However, I wanted to save it. Save it for a time when Emilicious could join us. You see, she lives within walking distance of the place and I thought it would be a shame if we didn't include her. Yes, she is that important. Upon arrival, we were greeted to live music and an open seating plan which sported a simple, almost rustic decor. As per usual, we decided to split some items. But before, that, we could've visit a brewery without some bevys right? 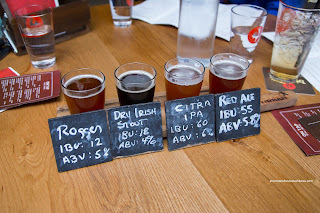 So I ordered the Flight consisting of Rossen, Dry Irish Stout, Citra IPA and Red Ale. I personally enjoyed the red ale the most as it was smooth going down while offering up a full-bodied brew that exhibited background caramel notes. 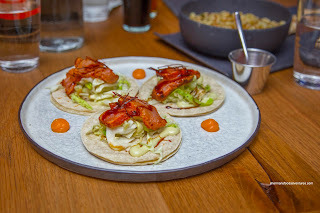 Moving onto the food, we began with the Wasabi Tuna Tacos atop 2 soft flour tortillas. The first thing that occurred to me was considerable amount of cabbage. Despite this, it still ate well with a fresh crunch that was interrupted by the buttery and smoky blackened tuna. The wasabi was definitely there, but not overwhelming. 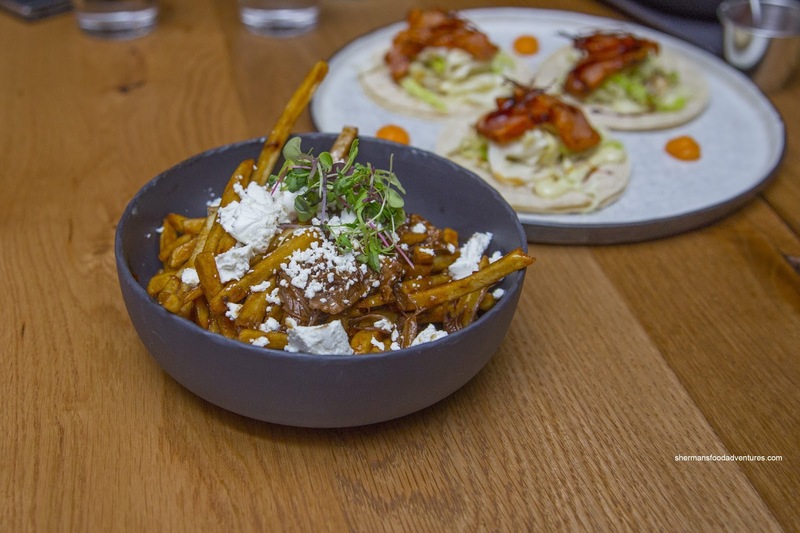 Next up was the Lamb & Feta Poutine featuring stout lamb confit, thyme, Okanagen goat cheese and demi glace. With a considerable amount of silky demi, the thin fries were on the wetter side while being quite dense and potatoey. The texture seemed more akin to russet potatoes. As for the lamb, there was a modest portion which was melt-in-my-mouth tender. 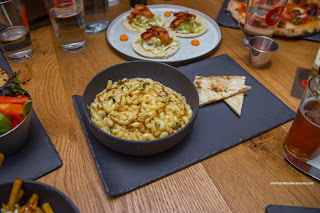 Also on the table was the extremely cheesy BRU Stout Mac n' Cheese. Each spoonful yielded a gooey mess of stringy cheese that was quite pleasant to the palate. However, that didn't translate into much impact though. The dish was lacking salt and sharpness. Despite this, we still enjoyed the dish as the noodles were toothsome while the jalapenos, balsamic and stout did come through. 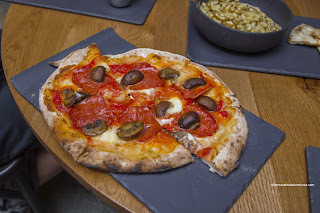 Presented off-centre on their tile plates, the Sopressetta and Mushroom Pizza was not bad. The dominant taste was from the Calabrese salami which offered up a lingering spiciness. We found the crust to be thin and crunchy with decent amount of char. It was also properly seasoned. Bear wasn't feeling particularly well, but decided to join us anyways. I suggested he get something that would be easy on the stomach such as a salad, but he would have nothing of it. He went for the Grilled Cheese instead. 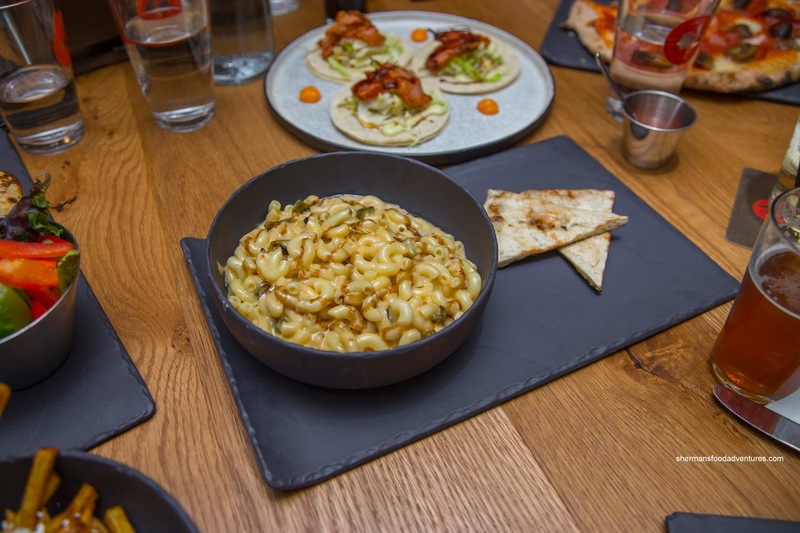 It consisted of aged white cheddar, apple, fire-roasted jalapeno and dijon. 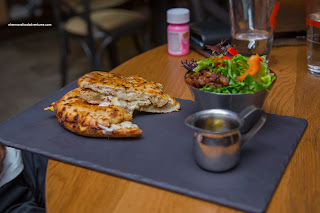 This was surprisingly good where the artisan bread was nicely crisped up while the cheese was perfectly melted. The combination of the sharp cheddar, spicy and tangy jalapenos and sweet apples offered up some complexity. In the end, the food at BRU was better than expected. With that being said, further refinement is needed.